CLICK HERE for the Madrid, Spain photo album. CLICK HERE for the Denia, Spain photo album. Krista reports for the team: We got off to a late start for the first camp - just because people seemed to just keep walking into the park for that camp. So because we got a bit of a late start, we ended late. Kids left before we ended because their parents were there to pick them up. Most of the kids stayed, though, so they were able to hear the word Cody told them about finding their purpose. The second camp ran a lot more smoothly than the first camp of the day today. The second camp is being held in a gym about 25 minutes away from where we are staying. Many of the kids in this afternoon camp already had some excellent basketball skills. Krista reports for the team: In both the morning and afernoon camps each coach has seen a lot of improvement with their kids today. It’s especially evident when we do contests. We do a handful of contests each day - like lane slides, free throws, cone layups, etc. - and we write down how many of each drill they do each day. Across the board, all the totals are higher than they were yesterday, which is what we like to see. So we are already seeing progress in making them better basketball players. Day 3 of camp was great. In both the morning and afternoon camps the kids did well. Not only are they increasing in their basketball skills, they are being challenged to think about the message of hope we are bringing to them each day in their team discussion times. Day 4 is in the books and it was a good day of teaching basketball skills and talking with and listening to our campers in small group team time. Krista reports for the team: Today was a good day. We focused on finishing strong with our kids and I think we all did that. Around 10 kids or so stayed after we packed up our stuff at the park, still playing with the ball the received from camp. Our kids were very receptive to everything we taught them, and the parents were grateful that we were there. Jason reports for the team: We are off and running and day 1 is in the books. We had 37 kids and they are an energetic group. The average age of the kids is quite young, so we are discovering that we need to make some adjustments to our typical camp schedule. We were thankful today because camp was indoors under a roof. We’ll be even more thankful tomorrow as they are going to give us some a/c. During team debrief time we heard details of one of the small groups where the children got into, not only a discussion with the coaches but among themselves, about our purpose in life. We are sure that more discussions like that are to come. It was especially interesting that this was in the youngest of the groups. Jason reports for the team: It was a great day 2 at camp. We picked up a few more kids, taking us close to 40. The adjustment in schedule seemed to help the attitude and energy level of these little ones. They seem to be catching on to how camp works and the rhythm of competitions. We look forward to their continued understanding to make things run smoother. It was great to hear that during competitions the teammates are wanting to know the names of other teammates so they can cheer for them by name; a great example of the kids wanting to support each other. Jason reports for the team: We survived hump day and it was a good one at that! The kids are really beginning to pick up on things. They are still struggling, but we are making it fun and they are having a good time. We did some fun competitions that added energy to the camp. Discussions are going very well in small group times. Jason reports for the team: We had a great 4th day of camp! Comments from the coaches are that the kids are improving as they are seeing scores go up in competitions and skill levels getting better. We also continue to hear stories of the kids interacting with each other during small group time. Questions spark conversations that allow the coach to definitely bring it back to conversations about our purpose in life and the message of hope we are sharing with them. Jason reports for the team: It was a great last day! The award ceremony was a great time for the kids and relationships were made. We know that the kids heard the message of hope we were able to bring to them this week in conjunction with teaching them about the game of basketball. CLICK HERE for the SPAIN photo album. We are grateful to report that the Spain team made it safely to Madrid, along with all their luggage! Their flight was delayed by an hour after they had boarded the plane at DFW, so their arrival in Madrid was delayed. But all is well. Lucas and Betsy, our hosts there, took the team for a driving tour of the city after they checked into their hotel and settled in. Tomorrow they will meet many of Lucas and Betsy's friends. We are hoping the team will remain healthy and work through jet lag quickly, and the campers will be excited to come to the camps next week. The Spain team has settled in nicely with time to rest and prepare for camps beginning tomorrow. Typically our teams don’t arrive in Madrid until late on Saturday, making Sunday their single day to rest and prepare for camps beginning on Monday. With this itinerary, they arrived Saturday morning, giving them a good portion of that day on site. They checked into the hotel, rested, and took a driving tour of the city. After they returned to the hotel and aired the basketballs preparing for camps, they walked the streets and enjoyed hot chocolate and pastries at 10:30 PM. Today after lunch, the team took a train downtown and toured different areas of the city. The last stop was to the monument park, which finished with a laser light show that began at 10:00 PM. It was another great day in Madrid! The team is ready for camps tomorrow. They’re excited for the camps scheduled for 10:00-1:00 PM and 5:00-8:00 PM. They learned today that starting on Tuesday, the last hour of the morning camp will be moved from inside the gym to an outside open court. It’s supposed to be 100 degrees, so it will be hot. They’ve been enjoying the meals so far. The hotel puts on a wonderful buffet. Every breakfast item you can think of was on the menu this morning. They enjoyed a meal of fish for lunch and steak for dinner. • Health for the team. They are all feeling well and working through jet lag. • Weather. Everyone will need endurance in the heat tomorrow. • Connections. We look for the team to connect quickly with the campers and the campers to feel open and safe with the coaches. The day began with a great breakfast buffet at the hotel, followed by a challenging word from Warren that set the tone for the day. The morning camp began at 10:00 AM, so the team was there at the gym at 9:00 AM to set up. A few minutes before 10:00, Mark was looking around for the paperwork, a necessary part of the camp. It was nowhere to be found. Laurie took a taxi back to the hotel a few minutes away, was given access to the room where the missing paperwork was sitting in the luggage, then hurried back so camp could start. They were delayed only by 10 minutes, which was not bad at all; just not the norm. There were 47 kids in the first camp, of which probably 30 were repeats from last year! There was a wide range of abilities and ages (from 7-17), but the coaches did a great job of keeping the energy level high. There were 15-20 parents who watched the camp from the stands. It was HOT, 100 degrees, so there were many water breaks. Laurie was on top of keeping everyone hydrated. The translators were awesome. The competitions went very well. This is one of their favorite parts of camp. After lunch, everyone napped from 2:00-4:00 PM and they were back on the court by 4:30 PM. Camp began at 5:00 PM with 30 kids, maybe 8 of those returning from last year. They formed 5 teams of 6, and with the smaller teams, they were able to work through stations and drills more quickly and ultimately able to go through more drills. The tired team had a delicious dinner of shrimp with rice, beef steak, roasted potatoes, salad, etc. at 9:00 PM, then debriefed at 10:30 PM. The reward for a hard day’s work was to treat themselves to ice cream from the shop closeby. Mark is grateful for a great team. Tristan is an awesome encourager, especially to the younger kids. Caroline is connecting with everyone as a big sister. • Continued Health. The team is healthy and feeling fine. • Endurance in the Heat. The heat really gets to everyone. Tomorrow they will move the last hour of the morning camp from the gym that’s not air conditioned to an open court outside. The forecast is for another day of 100 degrees. • Connections with the kids. The team has bonded so well and we hope that bond with each other will challenge the campers as well, and for their hearts to be softened to the truth. The morning camp had a full 50 campers today! It was the opportunity to live out the challenge David presented in the morning team time to stay strong and focused on what is important. Camps ran smoothly, as most second days do. The 3 new campers who joined today were middle aged, making Warren & Tristan’s team total 13. The coaches and translators were very flexible with a team of this size, especially when it came to competitions. They split the team into half and ran simultaneous contests in order to keep up with the rest of the teams. Chase also had a large team of 11. They really love him and is good with the younger kids. There were 24 in the afternoon camp. The breakout sessions were great again today. The coaches and kids had many meaningful conversations. The temp was well over 100 degrees today. The coaches were not looking forward to moving outside for the last hour of the morning camp. Mark was told to wait until he was asked to move outside to do so. There were folks all over the sports complex, but no one came to ask them to move outside. It was a sweet surprise. Hopefully it will stay this way the rest of the week. Mark has started a new tradition with this team. During lunch and dinner, he turns to one coach with “It’s Your Story,” a time to share with the team whatever they’d like to about their lives. It has served as a good team bonding tool. Taylor challenged the team this morning to be encouraging and energetic, even though bodies are tired, it’s HOT, and you just don’t feel like it. Wednesday is the hump day, most likely the hardest day of the week. It was the perfect reminder to the team. Despite the heat (well over 100 degrees again today), the kids worked hard. Coaches have been pleased with their improvements from day 1 to today, especially in the contests and skills. Everyone is having a blast. In fact, of the 48 campers in the morning camp and 24 in the afternoon camp, half of them indicated they would love to go back through the camp on Thursday/Friday. That camp may be full after all. Yesterday, the director of the sports complex did not ask Mark to move the camp outside from 11:00-12:00 PM, but today when Mark blew the whistle for a 2 minute water break, 75 kids came running in and took seats in the stands. So camp moved outside at that point. Having a smaller number of kids in the afternoon camp made for a quicker pace which means they were able to do more drills. It was a great camp. The team is healthy and bonding very well. Everyone is enjoying the new Hoops tradition "It’s Your Story." The team members from Arkansas shared the first part of the week, and today Taylor shared about her time living near the border, and Tristan shared his incredible journey. Last night, the guys went out for ice cream before heading for bed. Today, they didn’t even want ice cream. The two hour naps between camps helps, but they’re still tired. The team enjoyed a hearty breakfast from the buffet as well as coffee from the machine that can deliver coffee 8 different ways. That’s been a hit all week. 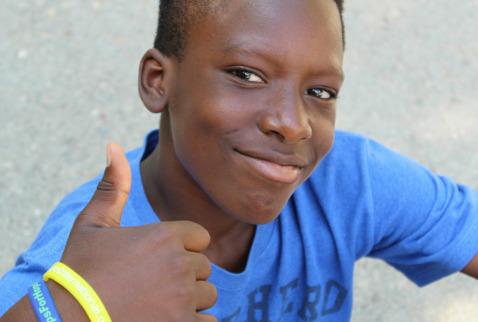 There were 31 kids in the camp today; 10 new ones and 21 who returned from the earlier camps this week. Those who returned knew the routine and helped the new campers catch on, setting the pace. In the morning camp, Taylor controlled the whistle for the mass ball handling, and Warren did the remainder of the morning camp. They both did an outstanding job, freeing Mark to do some one-on-one instructions with the kids. At 11:15 AM, the camp moved to the outdoor court where they worked through 15 more minutes of drills. They showed the campers alternate ways to do drills, which is the advantage of having kids who have been through camp already. It was over 100 degrees in the afternoon again, so there were plenty of water breaks. One mom brought lemonade for everyone and that was a real treat. The kids did a great job, considering they were engaged in basketball related physical activity for 5 hours! Caroline’s team of younger girls (7-9 year olds) tired more easily than the others. Tristan took his own team and did an outstanding job with them. He’s a great encourager. Today the coaches were more relaxed. They had been through 2 camps already and knew how things worked. And with coaches taking the whistle and running camp, Mark and Laurie were able to calculate scores and pack the equipment. It was a great end to the week of camps in Torrejon, Spain. Mark relinquished the whistle to Taylor who did an excellent job running the entire camp of 38 today! It was refreshing for him just to take the camp through team pics and let her take it from there. Warren took her team and did a great job as well. This team has been so flexible with changes along the way. The coaches adapted the drills, stations and contests to accommodate 75% of the campers who already knew the routine from being in the prior camps this week. They knew the talking points as well, so to conclude the last camp, instead of the coaches sharing their own stories in their small groups, Tristan shared the powerful story of his journey. The kids were so attentive as he talked. He worked very well with the translator, pausing at the right time for translation. The Arkansas part of the team (Brad, David, Warren & Caroline) taught the others some new ways to make drills, stations and contest more challenging. Warren changed/added to the ladder drills. The kids responded well to the alternate drills. Because of the repeat kids, this camp evolved into something totally different from the typical camp, and it was very good. Chase shared in "It’s Your Story" last night. It was so neat to learn more about his life. Mark has been so pleased with the way both sets of coaches have bonded. This time of sharing each day has really opened up lives to each other. After camp was over, the coaches hung around and said farewell to the kids and parents. It’s always encouraging to have kids take pics together with their coaches. The parents showed so much appreciation to the coaches this week. One dad brought fruit beginning Tuesday; watermelons, melons, and today it was cherries. They were wonderful! Parents also brought lemonade for the whole camp, which was so appreciated. I’ll close with the one-word description each coach shared about the trip. • Relationship. It’s amazing how much of a bond they were able to feel in just one short week. • Eye-opening. This coach grew up in a good home. This is the first time to see how many people were looking for something. • Challenging. This was a new paradigm for them. It was challenging to see people who were at best indifferent, making them more determined to share with them. • Fun. The whole camp and time together with the coaches was a blast. • Worthwhile. The time and effort put into making this camp happen was worth every bit of it. • Organized. It was appreciated that there was planning and organization in the camp which made things run as smoothly as possible. • New. This trip was a first for the coach in many ways; first time to coach with Hoops for Hope, first time to fly, first time to serve on a team like this. • Unity. One team built from 2 different states worked so well together with one goal.